To the observers in the field, there was no way to know if Crossfield was still alive. The entire craft was obscured by an immense ball of fire that blazed like the sun. Scott Crossfield was optimistic. After months of setbacks, the XLR-99 rocket engine was performing perfectly. The numerous delays had held up the development of the North American X-15. It was the most ambitious rocket engine that North American Aviation had ever built. With an unbelievable thrust of 57,000 pounds, it would make the new plane the fastest manned vehicle in history. Crossfield was completing the last of a series of pre-flight checks; the first big flight was scheduled for the next day. Cutting the throttle, Crossfield reported there were no malfunctions. Suddenly an immense force slammed him back into his seat. A colossal boom tore through the cockpit as a bright light stabbed into his eyes. The engine had exploded. To the observers in the field, there was no way to know if Crossfield was still alive. The entire craft was obscured by an immense ball of fire that blazed like the sun. This is because when ethyl alcohol and liquid oxygen burn together, the flame is incredibly strong. The heat is unbearable; the light is so intense it’s impossible to look at it without risking injury. Amazingly, Crossfield was still alive. The X-15’s solid steel frame and fuselage were designed to withstand the punishing rigors of space flight. 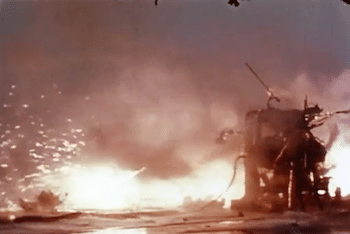 The front section of the craft had survived the detonation and was keeping the pilot alive. With a sense of calm born from necessity, Crossfield knew his only chance of survival was to stay put and wait for rescue. Opening the canopy would mean certain death. Within moments, the fire team was on the scene. They doused the craft with torrents of water from an airforce fuel truck, as a single mechanic struggled to open the cockpit. The glowing metal seared his hands as he tried to open the fuselage. The pain was so intense he couldn’t control his reflex to let go. Somehow, he got the cockpit open. Unwilling to crawl across the searing fuselage, Scott Crossfield instead jumped to the ground, taking the mechanic with him. Together they fled the flames – amazingly, neither of them were seriously injured. The burns on the mechanics hands were minor – his reflexes had saved him from losing his skin. This hadn’t been the first time Crossfield had survived an engine explosion in the X-15. In one of the earlier test flights, the engine of his plane exploded shortly after landing. He had a moment’s notice when a “fire warning” light flashed. Then a massive jar shook the craft. Alive and intact, Crossfield was shocked to see the explosion had torn apart the fuselage. Although he took tremendous risks with each flight, Scott Crossfield was no daredevil thrill seeker. True, he was a test pilot flying the fastest planes built to date. But he was also a coldly analytical engineer. His job was to make the X-15 safe for other pilots to fly. To that end, he dedicated his expertise and training. As an engineer, he performed endless calculations and ran exhaustive simulations. He had a hand in every aspect of the plane’s design and construction. In the history of aviation, there have been many great pilots and engineers. But there are few who could claim to be both. Crossfield’s experience as a pilot started when he enrolled in the Navy at the second world war. The Japanese attack at Pearl Harbor had left the fleet in tatters, and America desperately needed able pilots. So Crossfield was rushed into training. He began his primary training in Seattle and completed it shortly afterward at the Corpus Christi Naval Air Station. As a student pilot, he’d demonstrated a natural talent for flight. So as soon as he graduated, he was posted to flight and gunnery training officer. He spent most of the next few months in the air, training new airmen. Later, he joined Air Group 51 as their Engineering Officer. They were assigned to the carrier Langley, operating out of Hawaii. They were training for dive bombing missions as part of the planned invasion of Japan. When Japan surrendered following the Hiroshima and Nagasaki bombings, those plans were scrapped. In 1946, Crossfield returned to complete his studies at the University of Washington. He would spend the next four years there completing his aeronautical engineering degrees. He worked in the Kirsten Wind Tunnel, and there, he tested a variety of aircraft and refined their designs. He had a rare combination of aeronautical engineering training and practical flight experience. This combination meant he was perfectly suited to his next role. In 1950, he joined the National Advisory Committee for Aeronautics (NACA), the predecessor of today’s NASA. While there, he worked as an aeronautical research pilot. The space race between the US and Russia meant that his work was critical. Flying out of the Edwards Air Force Base, Scott Crossfield quickly gained more experience with rocket planes than any other pilot in the world. The outbreak of the Korean War had left him in charge of all the test programs running at Edwards. Never one to back down from a challenge, Crossfield put a large number of test planes through their paces. In such a dangerous line of work, it shouldn’t be too surprising that he had a number of close scrapes. 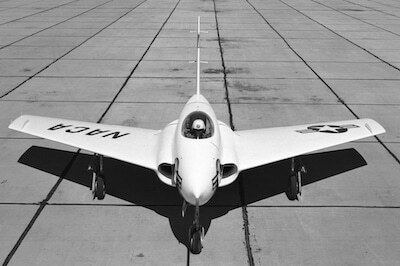 The first time he took the Northrop Bantam Skylancer up, the engines cut out at the top of a loop. Nonetheless, he made a perfect dead-stick landing. Walking away from the experience unharmed, he was keen for the next challenge. Just a few weeks later, he ran into trouble while flying the Douglas Skyrocket. This time, the engines cut out and the windshield iced over. With almost zero visibility, he was able to clear a small section of the windscreen with his sock. He followed the two chase planes down to safety. 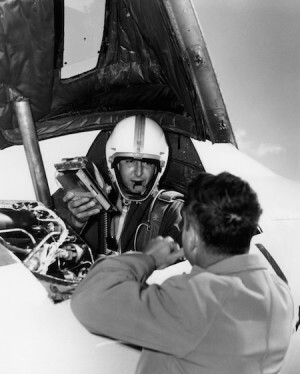 1953 was a historic year forCrossfield, as he became the first man to travel at twice the speed of sound. When he took his Skyrocket to 1,291 mph, he became the fastest human in history. It was a speed record he would break in the X-15, reaching Mach 3. During his time at Edwards, Scott would fly almost all the early X-series planes. With 99 rocket plane flights behind him, he was the perfect candidate for the X-15 program. But joining the program would mean leaving NACA and joining North American Aviation, the company tasked with building the world’s fastest aircraft. Starting as a design specialist, Crossfield played a role in designing many of the X-15’s systems, including a large role in the design of the X-15’s controls and its pressure suit system. The aim of the X-15 was to push every boundary. It had to fly faster and higher than any manned craft had done. The purpose was to gather data – data that would be used to design high-performance aircraft and spacecraft. It was intended to be a stepping stone towards a new generation of craft. And that meant climbing to unreached heights. 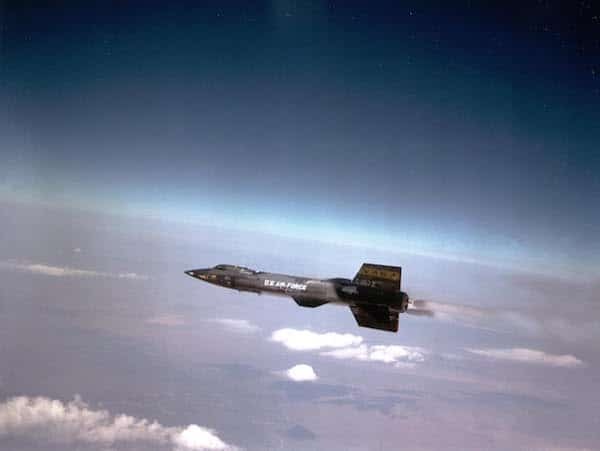 Unlike conventional aircraft, the X-15 had to be able to maneuver in space. Control surfaces only work within the atmosphere – in a vacuum, they would be entirely useless. The solution was reaction controls. These were small rocket thrusters mounted around the plane to steer it. With 2 different steering systems, the controls were more complex than an airplane. Simplifying the controls was a major challenge, but it was essential. But Crossfield’s contributions were not limited to engineering and design. He was also the first to fly the new plane. His role was to prove the plane was safe for the pilots who would follow him. The testing regime was extremely methodical. Every variable was isolated and examined to refine and perfect the design. As rocket engines burn their fuel extremely quickly, they must be able to land safely without power. This also means they can’t take off without assistance. 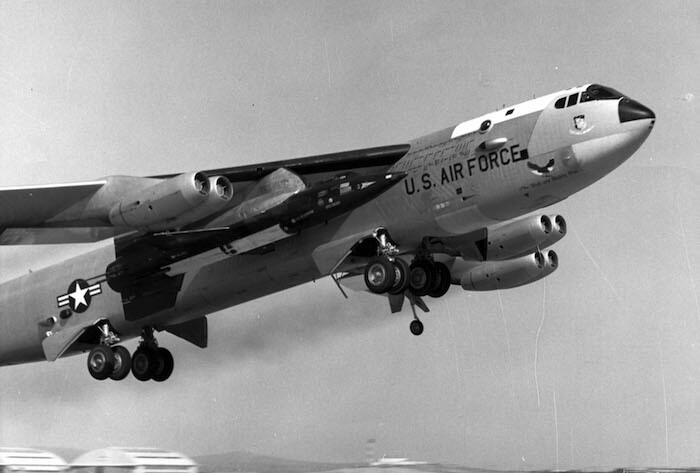 To reach its operational altitude of 8.5 miles, the X-15 required the help of a B-52. When attached to its mother ship, it looked like an oversized missile. To prove the design was safe, the X-15’s first flight was to be made without fuel. But on the first attempt, multiple failures forced Scott to abort for an emergency landing. The windshield iced over, and an auxiliary power unit overheated. The cockpit was flooded with smoke, and visibility was reduced to zero. The second attempt was much more successful. Scott glided the plane to a safe landing, proving it handled well. The first major hurdle had been overcome. There would be many more before the X-15 was ready. With meticulous planning and careful execution, all of them were overcome. Crossfield would make the first powered flight of the X-15 on September 17, 1959. Since the X-15’s rocket engines hadn’t been completed, the flight was made using the much weaker XLR-11 engines. But although these engines were weaker than the XLR-99, they still demanded respect. On his third powered flight, one of the engines exploded in mid-air. Scott was able to nurse his plane back to the ground, but the extreme forces broke its back just behind the cockpit. Crossfield escaped unharmed, and the plane was repaired and returned to service. On November 15, 1960, Scott made the first flight with the completed XLR-99 engines. During this flight, he would set a new speed record, taking the X-15 to Mach 3. He would earn him the International Harmon Trophy as the world’s outstanding aviator. The award was presented by President Kennedy. Scott would fly the X-15 two more times before handing it over to the NACA. Having completed the construction of the plane to spec, North American Aviation’s role was finished. Now test pilots like Neil Armstrong and William J. Knight would push the X-15 to its limits. They would leave the atmosphere and setting the unbroken speed record of Mach 6.72. Crossfield never flew into space. But his contributions to space flight were far from over. Following the success of the X-15 project, North America Aviation promoted him. He became the new Director of Space and Missile System Testing. From this position, Scott was responsible for several projects. This included the test and launch procedures for the Saturn booster rocket. He would also work on the Apollo command and service module. In 1967, Scott moved from North American Aviation to take a Vice President position at Eastern Airlines, the airline Eddie Rickenbacker had run in the 1930s, 40s and 50s. He was placed over Flight Research and Development. This included improving safety procedures and navigation controls for domestic commercial flights. In 1974, Crossfield left Eastern Airlines to work with Siddeley Aviation as a Senior Vice President. While there, he worked on a short haul airliner. Changing economic conditions meant the project was never completed. In 1975, he became a technical consultant for the United States House of Representatives Committee on Science and Technology. As a consultant, he helped them to plan for the growing challenges posed by increased domestic air traffic. His focus was collision prevention, and he helped to usher in our modern computerized national airspace system. In his later years, he continued to work as a consultant on a variety of aviation matters. He played a role in the SpaceShipOne project. He gave talks and lectured to air force trainees. And he wrote and published a number of autobiographical and technical works. On April 19, 2006, Crossfield flew his Cessna 210A into a fierce storm between Prattville, Alabama and Manassas, Virginia. The severe turbulence tore his plane apart, and he died in the crash. He was 84 years old. Throughout Crossfield’s long and distinguished aviation career, he collected many awards, honors, and recognitions. For a while, he was the fastest man alive. His name is stamped boldly on aviation history. Yet, for all his great personal accomplishments, his greatest role was supporting the endeavors of others. His courage and dedication to safety have enabled others to walk among the stars and return unharmed. His legacy is a lasting one. His work at North American Aviation helped put Man on the Moon. And his contributions to air safety have made commercial flight safer for everyone. Always Another Dawn: The Story of a Rocket Test Pilot, By Albert Scott Crossfield and Clay Blair Jr.
X-15 Diary: The Story of America’s First Space Ship, by Richard Tregaskis, foreword by Albert Scott Crossfield. James Darvell is a freelance writer from London who currently lives in Rome. He loves writing about a wide range of topics, and has a passion for history.